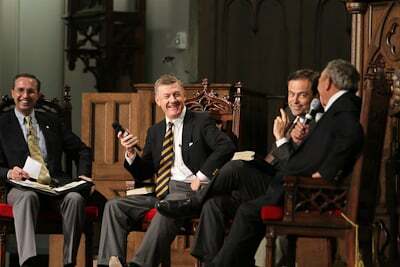 Mark Dever, Steven Lawson, R.C. Sproul, and R.C. Sproul Jr. answered questions from the audience this morning. Chris Larson moderated. Question: What is the relationship between preaching and evangelism? Mark Dever: When we preach, we preach all of Scripture. When we evangelize, we preach a portion of Scripture, namely, the gospel proper (the person and work of Christ and one’s need for a Savior). Q: What would be one of the most important books for a church planter to take with him? Steven Lawson: Commentaries are the most important for a pastor, not least a church plant. If it’s one book, then a commentary on Romans or a commentary on the gospel of John. Mark Dever: Go to 9Marks.org. There are tons of free resources there for the church planter. The most important question for a church planting pastor is: What is a church? The nature and function of the church informs the preaching of the pastor, and it’s what 9Marks has been about all these years. R.C. Sproul Jr.: If a one-volume commentary on the whole Bible, then Matthew Henry’s commentary would suffice. Steven Lawson’s book, The Expository Genius of John Calvin, would be immensely helpful so that the church planting pastor would be challenged to be resolute to preach faithfully, not simply to succeed. Pastors must be concerned primarily to fill the pulpit, not the building. R.C. Sproul: The Reformation Study Bible. Or Mark Dever’s Nine Marks of a Healthy Church. Q: What is the most important book of R.C. Sproul’s for a church planter? Q: Could you elaborate on contentment vs. discontentment in ministry? Steven Lawson: We are to be content with where the Lord has us and what has He has provided to us. Obviously, we are never to be content with our own mediocrity. We are to press on and reach forward. This is a holy discontentment that compels us to chase after holiness and excel still more in each of our ministries, especially in the call to see more people made disciples of Christ. Q: Could you, Mark Dever and R.C. Sproul, co-pastor the same church at the same time? Why or why not? Mark Dever and R.C. Sproul: I don’t think so. Mainly because of our differing views of baptism. Q: So that is that key point of difference that would bar a co-pastorate? Q: How can we better ensure that our preaching brings glory to God? Mark Dever: It is often assumed among evangelicals that casualness is the height of intimacy. But according to Scripture that is not true. R.C. Sproul: Jeremiah Burroughs’ Gospel Worship is an extended commentary on the judgment Nadab and Abihu received about offering “strange fire” on the altar (Lev. 10:1–2). This book, more than any others I have read, will challenge the leaders of the worship service to ensure that the service is God-centered. Q: As pastors, how do we minister in light of the fact of our continuing struggle with sin? Steven Lawson: The big picture is that God can and did speak through Balaam’s donkey. He can draw a straight line with a crooked stick. But we do not want to give anyone a free pass, not least pastors, who must strive after repentance and the rooting out of all sin in their lives. We won’t know until that final day whether or not certain people have been kingdom building with silver and gold or wood, hay, and stubble. Q: How many marks constitute a true church? Nine marks or three? Mark Dever: I could argue for one: the right preaching of the Word of God. Under this rubric would come the proper administration of baptism and the Supper as well as discipline. My nine marks are things that mark out a healthy true church from an unhealthy true church. The three marks laid out by the Reformers (the preaching of the gospel, the proper administration of the sacraments, and the right exercise of church discipline) were meant to mark out the contours of a true church vs. a false church. R.C. Sproul: It’s also important to note here that apostasy can only happen to someone who once was in the church but who now is out. This is the difference between an apostate and a pagan. And this can happen with institutions as it does with individuals. It’s also helpful to point out the difference between de facto apostasy and de jure apostasy. A church may retain a creed or confession that is orthodox, but their official practice may utterly belie their orthodox statement of faith. Q: To what extent are the doctrines of grace inherent to the content of the gospel? What about Arminianism? R.C. Sproul: Martin Luther called election the heart of the church. But I have yet to come to a place that a denial of the Reformed doctrine of election constitutes apostasy. I don’t think, for example, that outright Arminianism condemns one to hell, even if I think it is a gross error, bordering on heresy. Mark Dever: I agree. Any one, including Arminians, who trust in Christ alone for salvation is saved. It’s not heresy, because to my mind a “heretic” is by definition a non-Christian. It is an extreme error. I do think they hold their views inconsistently with the gospel, for if they were consistent, they may just teeter off into heresy. R.C. Sproul Jr.: We must also be careful not to treat the doctrines of grace as mere icing on the cake. There is an organic connection between the Protestant doctrine of justification by faith alone and the doctrines of grace. Q: How do those portions of Scripture (notably in Paul) that speak of there being “neither Jew nor Greek,” etc., effect the way we do church? Steven Lawson: The church is to be filled with people of every tongue and nation—a wonderful diversity—insofar as that is even a possibility in the area a church is located. Mark Dever: The ethnic specific church is not correct. We do get separated in our churches over the language we use, but we are to love people and expand the vision of the congregants to see themselves as closer, more unified to Christians of all ethnic backgrounds than those with whom they share ethnicity. R.C. Sproul: “Birds of a feather flock together.” It is very hard to overcome that. R.C. Sproul Jr.: Dr. King spoke rightly when he said we are to judge people on the basis of their character rather than on the color of their skin. I want to see the church be colorblind, but I don’t want them to buy into the quota mentality either. Q: Should we ever question someone’s salvation? Steven Lawson: If a pastor is leading in an unregenerate church, he cannot let things simply run as they always have. That pastor, if he is remiss to question others’ salvation, had better pull out of his naïveté and become a fruit inspector. I urge others to examine themselves, and I encourage pastors to do the same for the sake of their flock. R.C. Sproul: Our evangelistic outreach programs have hurt us in this regard. Simply getting a raised hand, or walking the aisle and saying the sinner’s prayer doesn’t seal the deal. We cannot just tally up all those who do such things as being “saved.” This leads to a cheap grace. Salvation comes because of the objective gospel of Christ Jesus. When one trusts wholly in the saving cross of the resurrected Christ, then he or she is saved. R.C. Sproul Jr.: Those outside the church need to be called to repent and believe. And so do those who profess and yet do not possess Christ in the church—they need to be called to repent and believe. Those who profess and possess Christ and yet doubt also need to be called to repent and believe. Finally, those who profess and possess Christ and are consistent in the faith need to be called to repent and believe. It is the universal call for everyone. Mark Dever: Pastors are unequivocally called to know the spiritual condition of the congregants. Christianity is personal, but is not private.